Lightweight and comfortable, cushioned with 3/4-inch-thick padding, mesh cover promotes air circulation. Convenient closure eliminates cumbersome shoelace ties. Can be used in bed or wheelchair. For use with or without the arm movement control strap (included). 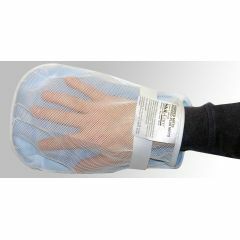 AllegroMedical.com presents The Hand Control Mitt Skil-Care One Size Fits Most. Lightweight and comfortable, cushioned with 3/4-inch-thick padding, mesh cover promotes air circulation. Convenient closure eliminates cumbersome shoelace ties. Can be used in bed or wheelchair. For use with or without the arm movement control strap (included). Limits picking and scratching.